Need a Facebook Timeline Image? I have known Jeanette for a couple of years now, we met at the Hay House “Have you got a book in you” Conference as finalists. We instantly took a liking to one another and were inseparable that weekend, having lots of fun and taking lots of opportunities. Recently I had to ask for a refund on a website being made by another company as the creators were very unprofessional and even started asking for very personal information such as my social media passwords. Something didn’t feel right, then when they started to not show up on appointment times without any notice time after time, I got fed up and asked for my money back. Fortunately with Jeanette’s help I received a full refund on the same day that I asked. So then I did what I felt in my heart all along and immediately booked in to have my website designed through Jeanette’s company “House Design.” Jeanette was extremely efficient and keen to get down to business and get it done. I found this very professional and was very happy with the fast responses as I am someone who also tries to get things done as soon as I can. She answered all of my E-mails and correspondence instantly, I always knew what was expected of me and if anything would cost extra. She gave me a few nudges and reminders to send things in too which was great as I have been so busy. She explained things to me in simple to understand terms when I didn’t understand some things. And she was very happy to answer questions I had. I fell in love with the template of the website as soon as I saw it. I was over the moon with how it looked I wanted to show everyone straight away. She sent me images of each page and was happy to make adjustments to anything I wanted changed around. I viewed the website on my phone and couldn’t believe how easy it was to navigate around on. My previous website didn’t line up properly on the phone and things seemed to be a bit out of shape. She sent me invoices with accurate descriptions of the work she was going to have done and was true to her word. She gave me receipts. She gave me a log in sheet with all of my details on it that I have put on file. She sent me instructions on how to edit things and run my website without having to constantly ask her to do it for me. I didn’t realize just how unprofessional the other company was until I dealt with Jeanette. They never even gave me their ABN number or an invoice for my payments. I wish I had just gone to her in the first place. It went live very quickly and I am extremely happy with it. In the first week I had almost 1,000 unique website visitors come and take a look at my new website and read my blogs. I have already started to get business through my online booking system too. Thanks for the great work Jeanette! SOCIAL MEDIA! Design House Now on INSTAGRAM! REBRANDING IS A MUST TO KEEP YOUR BUSINESS IMAGE FRESH, CURRENT, PROFESSIONAL & MODERN! Whatever your reason for rebranding; be it economic and operational expansion, technological innovation, growth and change, your company’s brand must remain consistent with the latest and greatest your business has to offer. Is you logo still modern or could it be refined to meet current design trends? Have you introduced social media? Is your website up to date, current, fresh & modern? 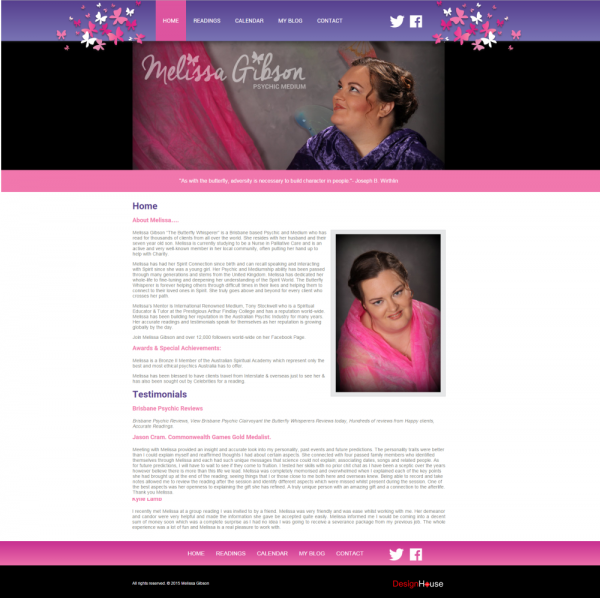 Are your business and profile photo’s current? At Design House I completely rebrand my website and promotional images nearly every two years. Check out the new portfolio section of my website HERE! 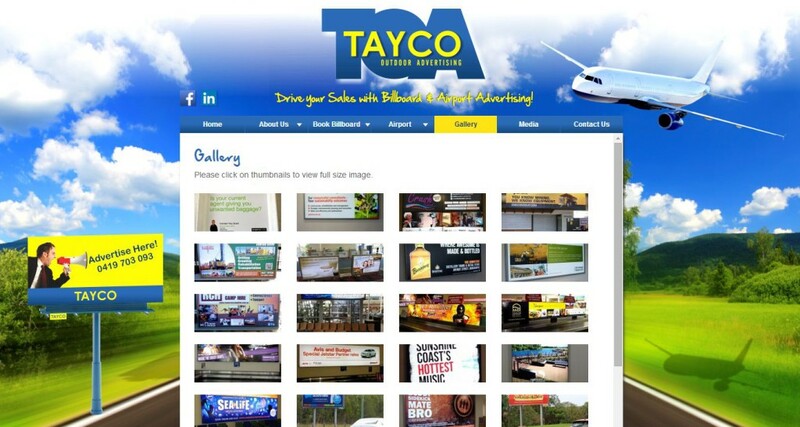 TAYCO OUTDOOR ADVERTISING REBRAND! Website, Logo & Facebook! Across Queensland, TAYCO offers billboards on key highways and cities and can offer you advertising at airports on the Sunshine Coast, Bundaberg and Emerald. TAYCO offers a complete package from concept to design, print and installation, with tailored solutions to suit all budgets. Just ask our satisfied customers. 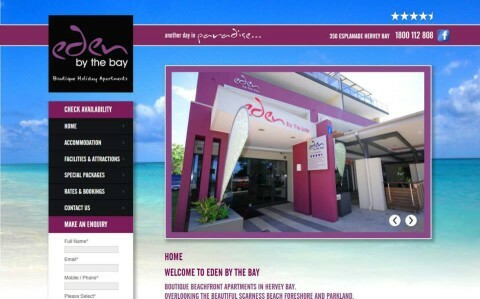 EDEN BY THE BAY goes LIVE! “Recently we engaged Jeanette from Design House to create and build a new website for our business. The whole process was seamless and Jeanette displayed a wealth of ideas and a unique and professional understanding of our requirements. These three elements are the core foundations of assisting YOU to where you want to go…who YOU want to be….and gain all that you desire! With iSee Coaching, you will develop your skills, knowledge and tools to assist you in moving toward your desired outcome. You will progress personally and professionally whilst gaining an understanding of the most important person in your life….YOU! You will also discover how to create balance in your life, become the person you desire you to be and achieve the outcomes you have always dreamt of. Whether our programs are for yourself or your clients, iSee Coaching is 100% dedicated to creating positive change. A change that is lasting! 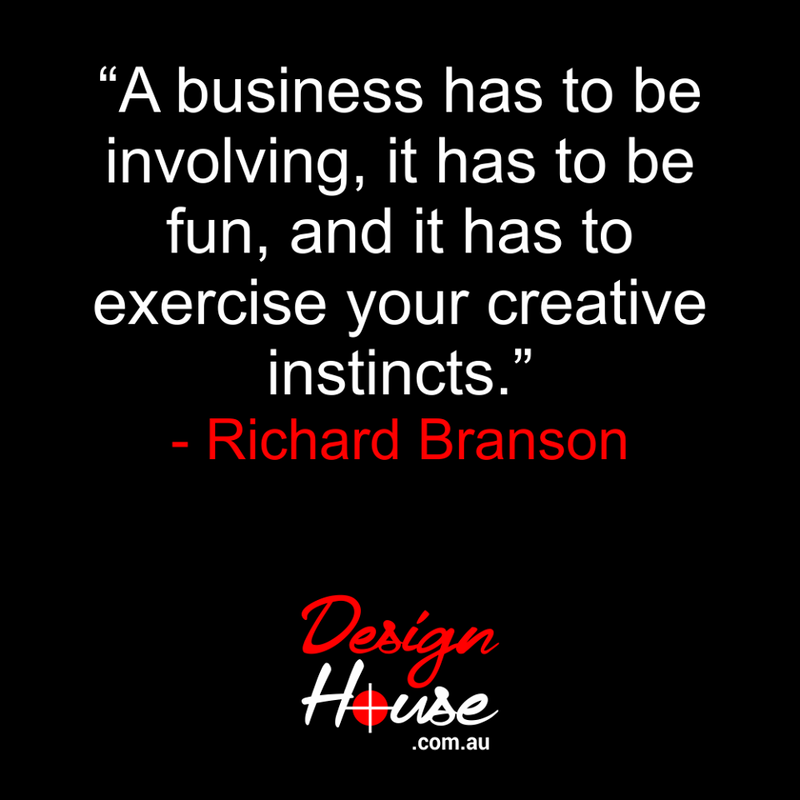 One that you or your client will maintain and prosper from. Click here for more info on the Starter Business Package! Carter Cooper keeping ahead of the Realestate Competition by engaging their clients online! Social Media set up & design by Jeanette Maynes DesignHouse! Social media marketing, has become one of the fastest methods of marketing a real estate business and their agents over the past couple of years. By involving yourself in these online communities through conversations and media sharing, you are passively opening up opportunities for people to become potential clients; homebuyers, sellers and investors. ‘LIKE’ on Facebook here! Follow them on TWITTER here! Subscribe on YouTube here! Facebook Cover Image | Business Page Set Up! Check out Russell Geldards from Elston Partners artwork here! 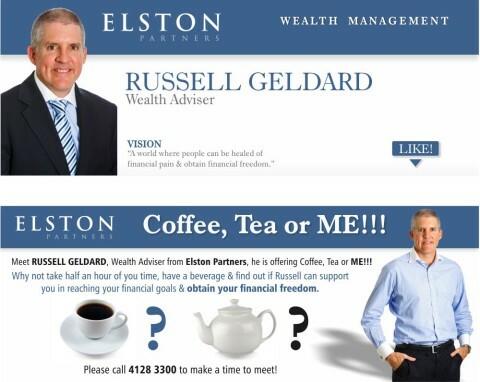 Meet Russell Geldard, Wealth Adviser from Elston Partners. He is offering Coffee, Tea or ME!!! Why not take half an hour of you time, have a beverage and find out if Russell can support you in reaching your financial goals and obtain your financial freedom. Call 4128 3300 to make a time to meet.